The What: Visionary Solutions, Inc., provider of AV network technologies, has introduced PacketAV Duet, a platform that delivers Dante connectivity for visually lossless, ultra-low latency 4K UHD video. The What Else: With Visionary's PacketTV and PacketAV products, 4K UHD, as well as full 1080p HD and lower resolution content can be deployed to a virtually limitless number of screens over any standard GbE network, even sharing space on existing enterprise networks, using standard network protocols and devices. A single network can carry audio, video, and data. Installation is designed to be as simple as possible, with no need for expensive proprietary components or 10GbE switches. Distributed displays and multi-component video walls are easily configured, and controllers from Crestron, AMX, and other third parties are supported. "Audio professionals have long understood the power, control, and expandability of the Dante platform for digital audio," said Scott Freshman, Visionary Solutions chief operating officer. "Now PacketAV Duet delivers that same connectivity for UHD video, enabling you to route video using Dante Controller. This is video for audio pros. If you know how to use Dante for audio, you know how to use PacketAV Duet for video. This really does change everything." 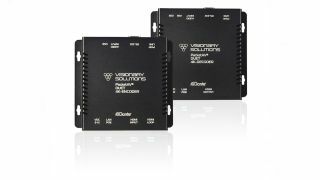 Visionary Solutions will be showing the new PacketAV Duet, along with their full range of high-performance AV network solutions, at ISE booth 6-K162. The Bottom Line: Visionary Solutions' PacketAV Duet Encoder and Decoder deliver visually lossless, ultra-low latency 4K UHD video and Dante over gigabit Ethernet, bypassing the constraints of traditional switch matrix systems by harnessing the flexibility and scalability of converged IP networks.